Prince Harry attended yesterday's opening of the first Field of Remembrance dedicated to those who have been killed in Afghanistan which has been created near the town of Wootton Bassett. Up to 35,000 crosses will be planted in the Royal British Legion’s Wootton Bassett Field of Remembrance at Lydiard Park in Wiltshire, each with a personal message from members of the public in order to commemorate the 343 men and women killed in Afghanistan since the conflict began in 2001. Prince Harry, who was in full Household Cavalry dress uniform with a blue Army Air Corps beret, planted a remembrance cross in the field and took part in a two-minute silence ceremony. He also met Service personnel taking part in the Royal British Legion’s March For Honour before seeing them off on their march to London. I’m a great fan of the Royal Family and the fact both Harry and William are in the Armed Services is brilliant. You can really relate to him [Harry] as he’s done it. He joked with us in a bit of rival Service banter. He made a comment about the Navy’s lack of ships and said we should move to the Army. We just said that’s too easy. Finally, Prince Harry met local schoolchildren before joining a private reception. The Royal British Legion’s National President, Lieutenant General Sir John Kiszely, also dedicated a cross, along with the Legion’s Repatriation Officer, Anne Bevis, Lance Corporal Ram Patten, who is leading the March For Honour, and Amanda Binnie, whose husband Corporal Sean Binnie was killed in Afghanistan in 2009. Civic dignitaries were also invited to dedicate and plant crosses, as well as representatives of the British Armed Forces. The Field of Remembrance is an important part of the Legion’s remembrance calendar of events. We encourage the nation to dedicate personal messages to those who sadly haven’t returned home. 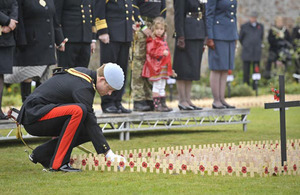 We are extremely honoured to have Prince Harry dedicate his own cross and take part in the ceremony. It will mean a lot to the people of Wootton Bassett and Wiltshire to know that there is a Field of Remembrance solely dedicated to those men and women in the British Armed Forces who have lost their lives in Afghanistan. This is the first of its kind, and we’re very proud. Today has been very moving,” he said. “It’s good that those who died are not being forgotten. It shows that people do appreciate the sacrifices that are being made. The Wootton Bassett Field of Remembrance at Lydiard Park’s Walled Garden is open daily between 0900 and 1600hrs from 9-21 November 2010.